“Genera” redirects here. For the operating system, see Genera (operating system). For other uses, see Genus (disambiguation). The hierarchy of biological classification‘s eight major taxonomic ranks. A family contains one or more genera. Intermediate minor rankings are not shown. The term “genus” comes from the Latin genus (“origin, type, group, race”), a noun form cognate with gignere (“to bear; to give birth to”). Linnaeus popularized its use in his 1753 Species Plantarum, but the French botanist Joseph Pitton de Tournefort (1656–1708) is considered “the founder of the modern concept of genera”. The rules for the scientific names of organisms are laid down in the Nomenclature Codes, which allow each species a single unique name that, for “animals” (including protists), “plants” (also including algae and fungi) and prokaryotes (Bacteria and Archaea), is Latin and binomial in form; this contrasts with common or vernacular names, which are non-standardized, can be non-unique, and typically also vary by country and language of usage. Except for viruses, the standard format for a species name comprises the generic name, indicating the genus to which the species belongs, followed by the specific epithet, which (within that genus) is unique to the species. For example, the gray wolf‘s scientific name is Canis lupus, with Canis (Lat. “dog”) being the generic name shared by the wolf’s close relatives and lupus (Lat. “wolf”) being the specific name particular to the wolf. A botanical example would be Hibiscus arnottianus, a particular species of the genus Hibiscus native to Hawaii. The specific name is written in lower-case and may be followed by subspecies names in zoology or a variety of infraspecific names in botany. The scientific names of virus species are descriptive, not binomial in form, and may or may not incorporate an indication of their containing genus; for example the virus species “Salmonid herpesvirus 1”, “Salmonid herpesvirus 2” and “Salmonid herpesvirus 3” are all within the genus Salmonivirus, however the genus to which the species with the formal names “Everglades virus” and “Ross River virus” are assigned is Alphavirus. As with scientific names at other ranks, in all groups other than viruses, names of genera may be cited with their authorities, typically in the form “author, year” in zoology, and “standard abbreviated author name” in botany. Thus in the examples above, the genus Canis would be cited in full as “Canis Linnaeus, 1758″ (zoological usage), while Hibiscus, also first established by Linnaeus but in 1753, is simply “Hibiscus L.” (botanical usage). In zoological usage, taxonomic names, including those of genera, are classified as “available” or “unavailable”. Available names are those published in accordance with the International Code of Zoological Nomenclature and not otherwise suppressed by subsequent decisions of the International Commission on Zoological Nomenclature (ICZN); the earliest such name for any taxon (for example, a genus) should then be selected as the “valid” (i.e., current or accepted) name for the taxon in question. Consequently, there will be more available names than valid names at any point in time, which names are currently in use depending on the judgement of taxonomists in either either combining taxa described under multiple names, or splitting taxa which may bring available names previously treated as synonyms back into use. “Unavailable” names in zoology comprise names that either were not published according to the provisions of the ICZN Code, or have subsequently been suppressed, e.g., incorrect original or subsequent spellings, names published only in a thesis, and generic names published after 1930 with no type species indicated. In botany, similar concepts exist but with different labels. The botanical equivalent of zoology’s “available name” is a validly published name. An invalidly published name is a nomen invalidum or nom. inval. ; a rejected name is a nomen rejiciendum or nom. rej. ; a later homonym of a validly published name is a nomen illegitimum or nom. illeg. ; for a full list refer the International Code of Nomenclature for algae, fungi, and plants (ICNafp) and the work cited above by Hawksworth, 2010. In place of the “valid taxon” in zoology, the nearest equivalent in botany is “correct name” or “current name” which can, again, differ or change with alternative taxonomic treatments or new information that results in previously accepted genera being combined or split. Prokaryote and virus Codes of Nomenclature also exist which serve as a reference for designating currently accepted genus names as opposed to others which may be either reduced to synonymy, or, in the case of prokaryotes, relegated to a status of “names without standing in prokaryotic nomenclature”. Proboscidea is the order of elephants and the genus of devil’s claws. The type genus forms the base for higher taxonomic ranks, such as the family name Canidae (“Canids”) based on Canis. However, this does not typically ascend more than one or two levels: the order to which dogs and wolves belong is Carnivora (“Carnivores”). 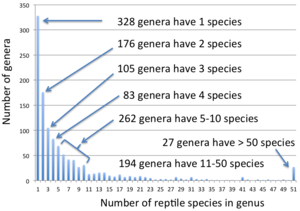 The numbers of either accepted, or all published genus names is not known precisely although the latter value has been estimated by Rees et al., 2017 at approximately 510,000 as at end 2016, increasing at some 2,500 per year. “Official” registers of taxon names at all ranks, including genera, exist for a few groups only such as viruses and prokaryotes, while for others there are compendia with no “official” standing such as Index Fungorum for Fungi, Index Nominum Algarum and AlgaeBase for algae, Index Nominum Genericorum and the International Plant Names Index for plants in general, and ferns through angiosperms, respectively, and Nomenclator Zoologicus and the Index to Organism Names for zoological names. A deduplicated list of genus names covering all taxonomic groups, compiled from resources such as the above as well as other literature sources, created as the “Interim Register of Marine and Nonmarine Genera” (IRMNG), is estimated to contain around 95% of all published names at generic level, and lists approximately 490,100 genus names in its March 2019 release; of these, approx. 265,500 are presently flagged “accepted” (including both extant and fossil taxa), 127,500 as unaccepted for a range of reasons, and an additional 126,000 not yet assessed for taxonomic status. Included in the 265,500 accepted, extant plus fossil genus names in the March 2019 edition of IRMNG are 188,158 genera of animals (kingdom Animalia), 21,935 Plantae (land plants and non-Chromistan algae), 10,231 Fungi, 9,989 Chromista, 1,963 Protozoa, 3,387 Prokaryotes (3,247 Bacteria plus 140 Archaea) and 851 Viruses, although totals for some eukaryote groups will be an underestimate since the present “uncertain” (=unassessed) category (which contains largely animal and protozoan genus names) contains a mix of names that should ultimately be allocated either to “accepted” and “unaccepted” upon further investigation. By comparison, the 2018 annual edition of the Catalogue of Life (estimated >90% complete, for extant species in the main) contains currently 175,363 “accepted” genus names for 1,744,204 living and 59,284 extinct species, also including genus names only (no species) for some groups. Which species are assigned to a genus is somewhat arbitrary. Although all species within a genus are supposed to be “similar” there are no objective criteria for grouping species into genera. There is much debate among zoologists whether large, species-rich genera should be maintained, as it is extremely difficult to come up with identification keys or even character sets that distinguish all species. Hence, many taxonomists argue in favor of breaking down large genera. For instance, the lizard genus Anolis has been suggested to be broken down into 8 or so different genera which would bring its ~400 species to smaller, more manageable subsets. ^ a b “ICTV Taxonomy”. International Committee on Taxonomy of Viruses. 2017. Retrieved May 29, 2018. ^ Sigward, J. D.; Sutton, M. D.; Bennett, K. D. (2018). “How big is a genus? Towards a nomothetic systematics”. Zoological Journal of the Linnean Society. 183 (2): 237–252. doi:10.1093/zoolinnean/zlx059. ^ Gill, F. B.; Slikas, B.; Sheldon, F. H. (2005). “Phylogeny of titmice (Paridae): II. Species relationships based on sequences of the mitochondrial cytochrome-b gene”. Auk. 122 (1): 121–143. doi:10.1642/0004-8038(2005)122[0121:POTPIS]2.0.CO;2. ^ a b de la Maza-Benignos, Mauricio; Lozano-Vilano, Ma. de Lourdes; García-Ramírez, María Elena (December 2015). “Response paper: Morphometric article by Mejía et al. 2015 alluding genera Herichthys and Nosferatu displays serious inconsistencies”. Neotropical Ichthyology. 13 (4): 673–676. doi:10.1590/1982-0224-20150066. ^ “Genus”. Merriam-Webster Dictionary. Retrieved 2019-03-19. ^ Harper, Douglas. “genus”. Online Etymology Dictionary. ^ a b “IRMNG: Interim Register of Marine and Nonmarine Genera”. www.irmng.org. Retrieved 2016-11-17. ^ Rees, Tony; Vandepitte, Leen; Decock, Wim; Vanhoorne, Bart (2017). “IRMNG 2006–2016: 10 Years of a Global Taxonomic Database”. Biodiversity Informatics. 12: 1–44. doi:10.17161/bi.v12i0.6522. ^ Frodin, David G. (2004). “History and concepts of big plant genera”. Taxon. 53 (3): 753–776. doi:10.2307/4135449. JSTOR 4135449. ^ Nicholson, K. E.; Crother, B. I.; Guyer, C.; Savage, J.M. (2012). “It is time for a new classification of anoles (Squamata: Dactyloidae)” (PDF). Zootaxa. 3477: 1–108.